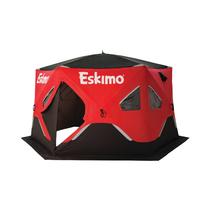 Fish more comfortably with more people and more gear in the all new Fatfish ™ 6120i fully-insulated six-sided shelter. The FatFish 6120i is a wide-bottom hexagon-six-sided shelter that features the fishable area that the Fatfish is known for. In fact, the FatFish 6120i offers 23% more fishable area than what a comparable non-wide bottom would offer. With FatFish styling accents, YKK® zippers, 11mm poles, and all-metal-ball-and socket hub design, the FatFish 6120i is built to stand up to the elements. With over 76” of height-at-center and 80 Square feet of fishable area, the FatFish 6120i is sized just right. Not too big, not too small. The FatFish 6120i features Eskimo IQ™ insulated-quilted. IQ fabric is up to 35% warmer that non-insulated fabric. Fishable Area: 80 sq. ft.